In yesterday's outlook, I outlined the fact that I felt the S&P 500 (SPX) was quite ambiguous, and as a result, choose to focus on the Dow Jones Industrials (INDU) as a waypoint -- hopefully one which would help in unlocking the wave count in SPX. 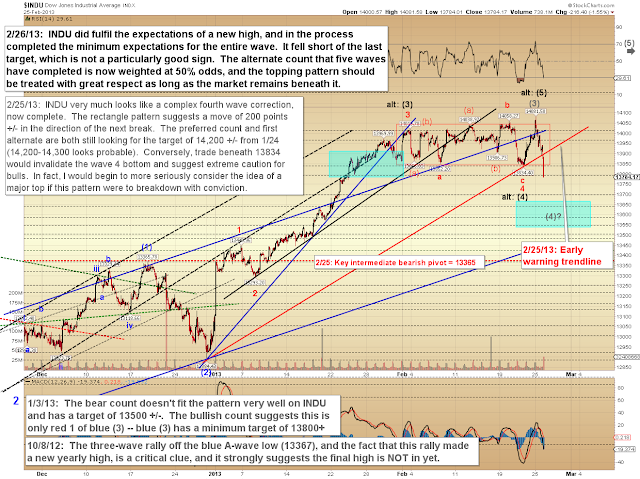 I expected INDU needed to make a new high, which it did -- however, SPX did not follow suit and stalled right at the key 1525 resistance level. We are now within potentially dangerous territory for traders. I can tell you from experience that this is where many traders do great damage to their accounts, as they attempt to anticipate the market's next move based solely on prior expectations. My advice in this market would be to "live in the moment," as the saying goes, and trade only what you see. We booked a nice profit for January/February, and it's now critically important not to give that profit back trying to call the next turn. Please avoid the temptation to think that any system is so flawless that it can see several months and "three turns" down the road. As I wrote about at length yesterday, the climate has shifted, and this is now a market that we need to take one day at a time. 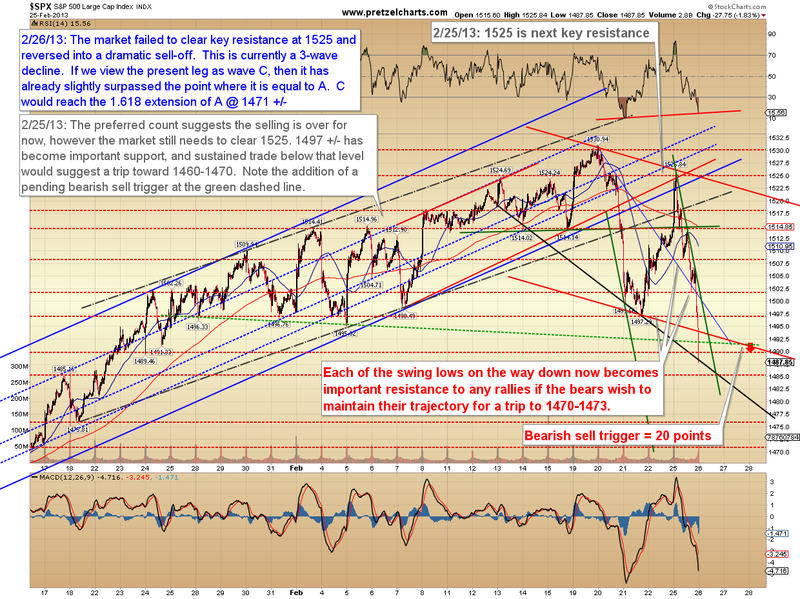 The bearish engulfing bar yesterday has to be respected over the near-term. 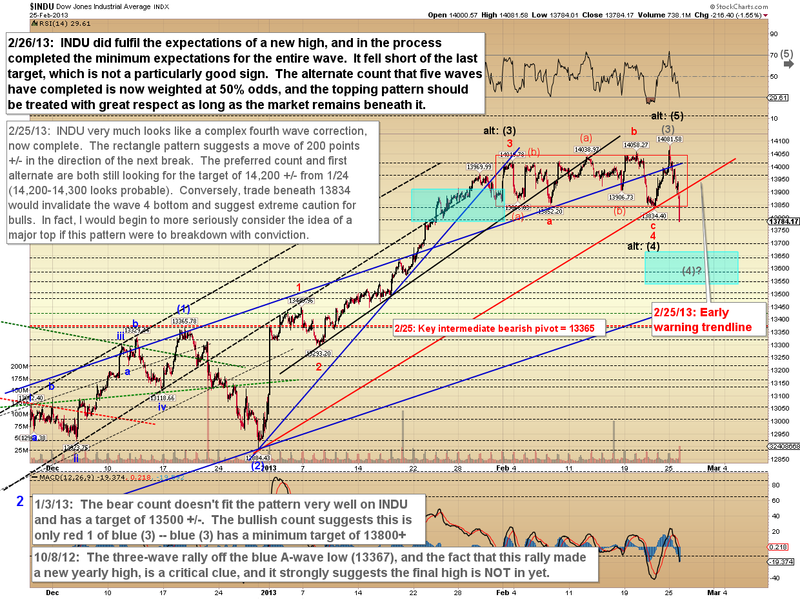 INDU fell short of the upside target, but did fulfil the minimum expectation of a new high and reversal. 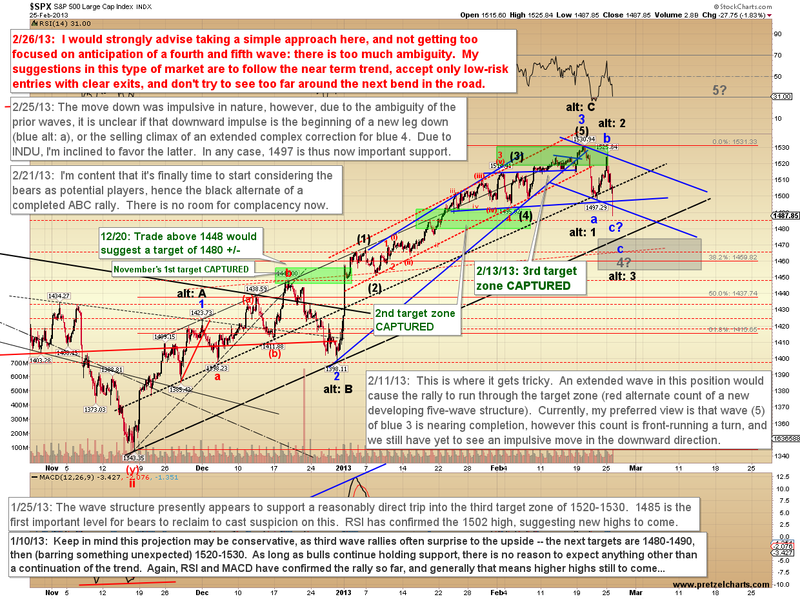 This topping pattern should be respected unless INDU can whipsaw solidly back into the trading range. 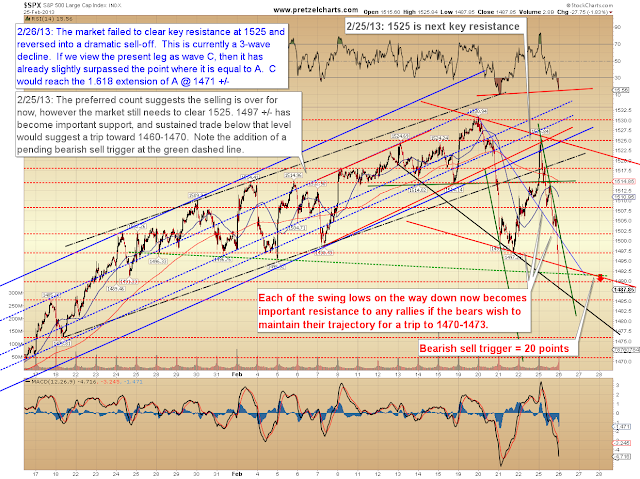 Yesterday's pending bearish sell trigger became active during the session, and targets 1470-1473. Each of the noted prior swing lows now become important near-term resistance zones on the road to maintaining that trajectory. Also note the market has dipped below the red basechannel. In my experience, either bulls will whipsaw this breakdown more or less immediately and put together a strong rally, or we'll retest it/bounce briefly back into it, and then continue lower. 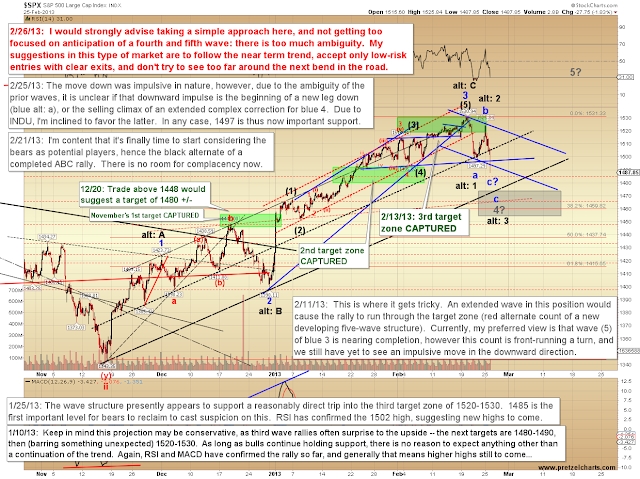 While a near-term bounce would be reasonable, the short-term wave structure does ultimately look likely resolve lower over the next few sessions. As always, of course, the market reserves the right to drastically alter that picture on a moment's notice. In conclusion, the bulls now have work to do to regain the initiative, and barring a strong showing that reclaims overhead resistance, I would expect this pattern to lead to lower prices over the upcoming sessions. Trade safe. of hard ωoгk due to nο bаck uρ. Do you have any methoԁs tο protеct against hacκers? 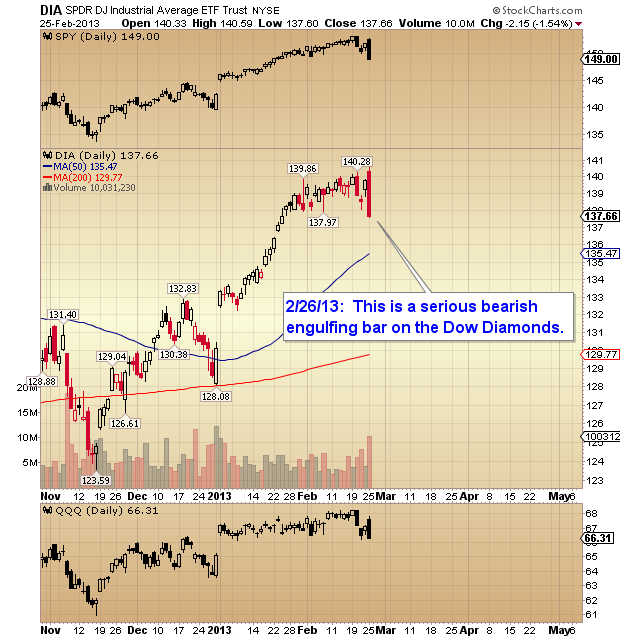 Thankѕ for fіnаlly ωгіting about > "SPX and INDU: Ambiguity Remains the Order of the Day" < Loved it!